1 . CONSCIENTIOUS.—Men who have studied European history, who have travelled widely, who speak several foreign languages, who are conversant with the work of The Hague Peace Conferences. Self-critical, demanding both sides of a case before they act. 2. LOYAL.—Responsive to calls for help. Ready to defend the weak against the strong. Prompt to pay debts they have themselves contracted. Serious-minded men, who have no hesitation in supporting a cause obviously just. They support their country because their country seems loyal to greater causes. 3. PATRIOTIC.—Men who admit their own ignorance and are not conversant with the details of the real issues at stake, but who are willing to sacrifice themselves for what they are told is their country’s good without considering whether this is also good for other countries. My country right or wrong. 4. ADVENTURE.—Men who are young, healthy and energetic, fond of travel, sport and shooting animals, but who have not had many other opportunities of Continental travel. 5. EXAMPLE.—Men who don’t think for themselves, who join ” pals ” battalions because everybody’s doing it, men unable to endure isolated action. Theirs not to reason why. 6. ECONOMIC.—Men discharged from other occupations, with no resources or alternatives, driven to enlist by necessity (the economic pressgang) in order to get a living, not cowards, but perhaps quite content as long as they need not fight. 7. ESCAPE.—Men who wish to get away from home conditions, away from wife, from debt, from arrest for crime. Men wanting a cheap divorce or leaving on account of the girl left behind. 8. BARBARIC.—Mere bloodthirstiness or homicidal mania and a general desire to break bounds. Let us hope no old Bootham boys come into groups 7 and 8. But what are the numbers in the other groups? Hugh Richardson is likely to have been the Hugh Richardson who was at Bootham between 1875 and 1880, and taught science at the school between 1897 and 1914. His letter was printed in ‘Bootham’ magazine, Volume VII, March 1915. A Bootham Old Scholar, Giles Cookson (1993-2000), has created a website to make available online his collection of over 2000 postcards. Many of them are of York, and there are a number of Bootham School. The website is www.thecardindex.com where you can search for postcards and also add comments. Below are some examples from the website. Visit the website and search for Bootham School to see lots more. In January I did a talk as part of the Thursday lunchtime recital room series. It was entitled ‘Memories from the Archives’ and I talked about a number of memories of Old Scholars. I’ll publish the photographs and text from the talk in several parts on the blog. Today I’ve chosen to focus on the memories of students have of Bootham. Accounts by Old Scholars of their time at school turn up in various places – the school magazine (often comparing their own schooldays to the present-day school that they read about); the early editions of the register often contained stories of their most notable achievements or exploits at school; often Old Scholars will send in their memories for the archive, sometimes as part of an autobiography, other times just remembering one particular incident; over the years a number of oral history recordings have been done, and memories have been collected at anniversaries of particular events. In some ways these memories are a different kind of record to the ‘official’ documents – minutes, prospectuses, reports and so on. Often you need to bear in mind that the account may be of something that happened many years earlier, is written from the perspective of one individual, and depending on the audience, may have been edited! Having said that, the memories of individuals give an amazing insight into the experience of being at Bootham over the years, and when you piece those together with other records, a much wider picture starts to emerge. The memories often mention aspects of school life that would get missed out of the ‘official’ documents, perhaps because they weren’t seen as important or noteworthy. But I think that it’s often when you start to be able to see things through the eyes of individuals that events that happened in the past seem to come alive. I’ve picked out about half a dozen pieces of writing by Old Scholars recalling their schooldays, and have pulled out short passages from each. I’ll work through them chronologically, although there isn’t time to give a complete history of the school. The first individual is George Scarr Watson, who was at Bootham between 1853 and 1858. I’ve put up a photograph of the back of the school from 1863 to give you an idea of what it might have looked like around the time that he was there. The school was originally started in 1823 in premises in Lawrence Street. For the first six years it was run by William Simpson, and then in 1829 the school was brought under the care of the Yorkshire Quarterly Meeting of the Society of Friends. At that point it was known officially as the Yorkshire Quarterly Meeting Boys School, and more generally as York Friends Boys School. 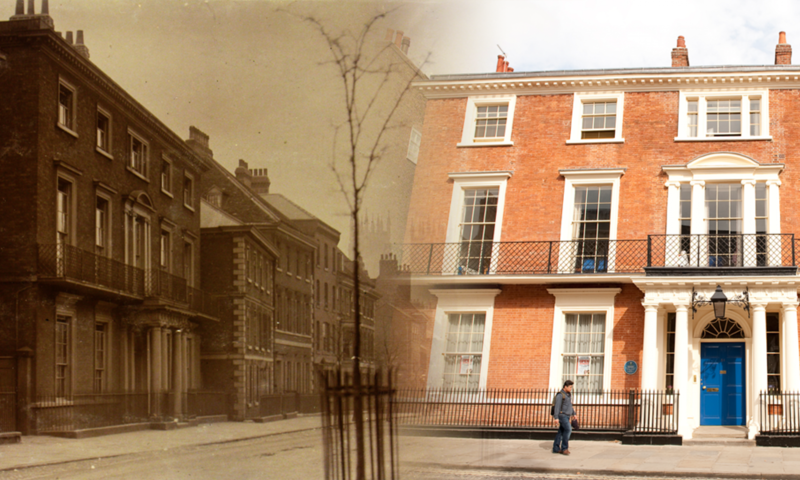 In 1846 the school moved to Bootham, after the purchase of 51 Bootham, then known as No 20 Bootham, from Sir John Johnstone for £4,500. The decision to move had been made because of concerns over ill-health at the Lawrence Street site, and the Foss Islands area was not seen as particularly healthy. The photograph gives an idea of what the grounds at the back of the Bootham site looked like before the fire in 1899, which destroyed much of what you can see in the photograph.